DKW was a car and motorcycle manufacturer founded in 1916, “DKW” roughly translating to Steam Powered Cars. Although DKW’s steam powered cars were unsuccessful, DKW produced a small 2 stroke engine to be sold as a toy called “The Boys’ Wish” / “Des Knaben Wunsch” development of this engine led to DKW’s range of small motorcycles. By the late 1920’s DKW was the largest motorcycle manufacturer in the world. In 1932, DKW merged along with 3 other automobile manufacturers (Including Audi) to form the “Auto Union”, each manufacturer representing one of the four rings. Late 1930’s, DKW created the RT98, a lightweight motorcycle was and still is considered a masterpiece of design and German engineering. The RT98 being one of the most copied models of motorcycles of the time. Manufacturers such as BSA, Harley Davidson and Royal Enfield all jumping on the lightweight motorcycle bandwagon creating their own variations on the single cylinder platform. The RT98 had two models throughout the 6 years of production (1934-40). The second superior model (The RT98 3PS) has subtle changes, this mostly consisted of an improved power output from 2.5HP to 3HP. DKW saw sales of this specific RT98 model reach 67,000 before production was ceased. This particular 1938 DKW RT98 (RT100 3PS) has been restored by its current owner to a high standard. The owner had a vision of keeping a lot of the originality of the bike in the form of patina, lacquering countless components to a professional finish. Taking a moment to appreciate what this bike has seen, surviving nearly 80 years since manufacture and the whole of WW2. If only this bike had a voice! You might be asking, why is this bike is on Lacey’s Motorcycles.co.uk? This particular bike required some work that definitely needed documenting. The overall goal of this part-restoration was to get it ready for its MOT. We soon diagnosed it had severe play in the front suspension components, which of course is a big part of a motorcycle and indeed, an MOT test. 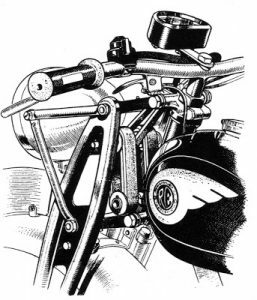 The front suspension being a unique part to the DKW’s design, it comprises of three thick rubber bands controlling the compression and rebound from the road. These rubber bands mounted through the upper and lower yokes on “C” shaped arms, eventually connected up to the heavy duty fork legs. This design was to be copied by bikes such as the Royal Enfield Flying Flee later on in the 1960’s, making subtle changes to suit the more comfortable riding style. 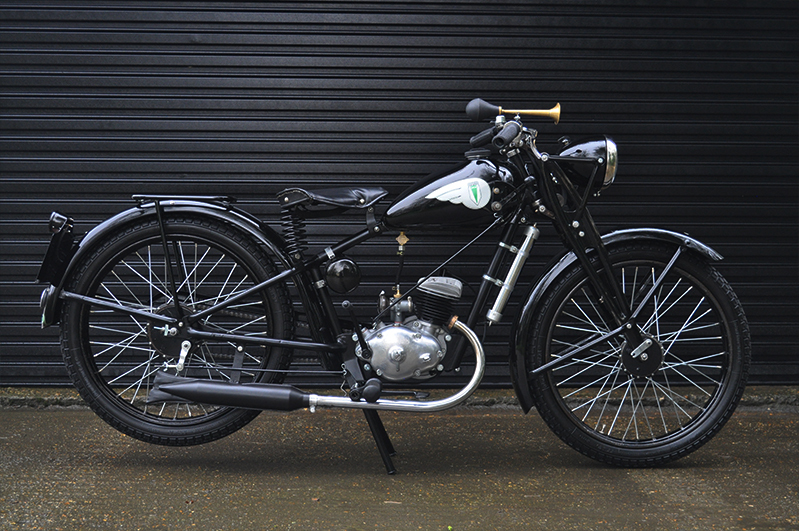 Being a bike from the 1930’s, DKW decided against sleeves as seen on the newer bikes. This obviously resulted in excess play over time – not helped by the strict guidelines of today. The play was primarily in the shafts that hold the “C” shaped arms in place. These shafts had to be built up in copper for the excess play, then chrome plated for a more durable finish. In doing so, we put back a staggering 0.63mm of hard wearing material back into these shafts – This will make sure that the bike stays roadworthy for many years to come. This bike also required a full engine overhaul although already stripped. This engine having many similarities to our 1953 Peugeot Triporteur and probably many other engines of this size and era. As per usual, we made sure all parts were present due to the engine being in a box when we received it. Fortunately, all the parts were present and every component could be meticulously cleaned and refurbished to the appropriate finish. Shaft ends, original casing bolts and all external engine components were zinc plated for that high-quality standard of finish. 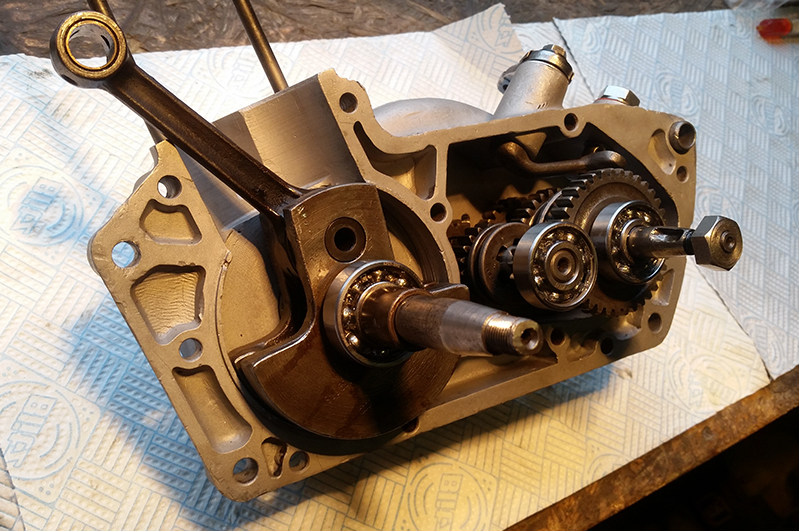 All of the bearings in the entire engine replaced for new whilst the engine is stripped – All aluminium castings refinished using fine glass bead, washed out and threads cut before final assembly with new OE Spec gaskets, Honed cylinder and New old stock piston. 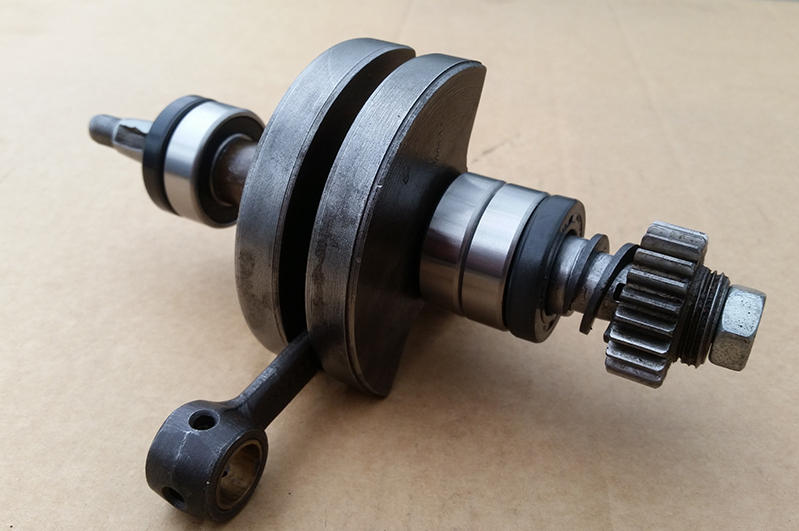 While assembling the top end, we soon realised that there was excess play in the gudgeon pin and little end bush – due to the new piston being a slight variation of model. This required us to drive the old phosphor bronze bush out and replace it with a slightly smaller inside diameter to cater for the new gudgeon pin. 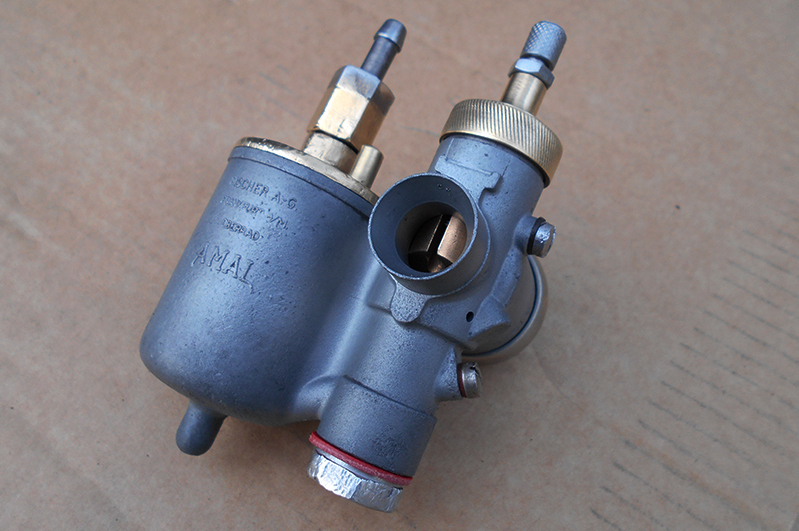 The original oil ways were duplicated over to the new bush as per original spec. 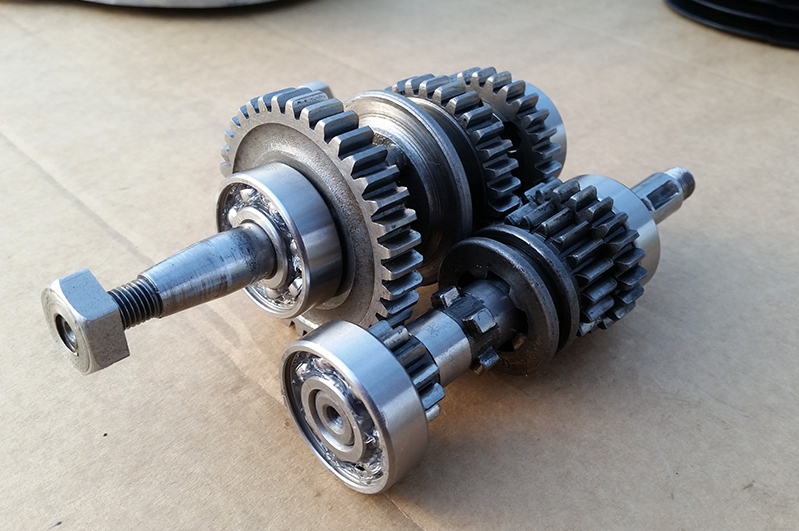 This engine has truly had a full overhaul – Factory Fresh! This engine is not just going to look spectacular mounted to the bike, but hopefully run beautifully too for years to come. A gentle running in process will do this bike the world of good. The last major task for our commission was to create a brand new “DKW Spec” wiring loom, with original front and rear parking lights and 4 Volt battery cell lighting feed. The loom to be finished in vintage spec cloth loom as per original. The loom once made, was mounted throughout the bike using original photos for routeing guidance. Sourcing a period style switch; mounted on the headlight cowl to control the lighting circuits. Full operation of the parking, dip and full beams whenever the rider pleases. This DKW represents German engineering at its finest and despite its 79-year old life, it has worn well. Whilst un-bushed shafts showed considerable wear, and areas of metal to metal contact were well worn, gentle welding and machining, together with replacement bearings and bushes have brought this bike back to the condition it left the factory in 1938. The tank mounted gear change works so much better than many of the French gearboxes we have rebuilt from a similar period. Everything simply works well as you would expect and clearly the quality of German steel is high as the ravages of German winters have had only minimal effect on the cosmetic finish of the metals. Whilst working on a bike of this age, you cannot help but wonder at the sites this machine must have seen and the stories it could tell, having survived the Second World War. Many other manufacturers including those in the UK, copied elements of the DKW's design and in our opinion, a rather poor attempt. The DKW's general panel fit is still one of precision and no bending is required to re-assemble, unlike many British made machines of the same period. Working on this DKW is a delight, and what makes it so?, metric fixings throughout. The DKW has received many new fixings and now shows a true patina of its near 80 years rather than simply decrepit old age. A truly delightful machine that has now found its way on our own “list of wants”.